Hello there friend! Today we’re going to talk about something that may cause you to blush. We’re talking poop. More specifically we’re talking poop and why it’s so important to have regular daily BMs. As anyone who knows me can tell you I will talk about poop literally any place, any time, anywhere, and with anyone, even if I’ve just met them. I also fully believe that a day that doesn’t start with a solid BM is a day hardly worth living. I know I’m being slightly hyperbolic here, but seriously, days sans a good poop just don’t feel as great. As you likely know, poop is the end product of digestion. Good digestion leads to good poops that should be easy to pass (no straining necessary), regular (at least once a day, but after every meal also feels amazing and is the natural rhythm—out with the old, in with the new and all that. Seriously, if you have babies or are around one they poop after every meal. Glorious. ), largely scent-free, bulky, and in one piece. It will likely taper at both ends and may come apart when you flush. Graphic, yes, but poop is so important I’m willing to gross you out a little bit. Your daily excretions is one of the major ways in which your body detoxifies itself. Your liver is charged with cleansing your blood and breaking down and excreting the various toxins you come in contact with on a daily basis through metabolic processes, inhalation, makeup and beauty products, cleaning supplies, pesticide residues on food, and so on. Now I want to talk briefly about the often hilarious, sometimes silent, sometimes deadly side of digestion. If you are properly breaking down and absorbing your meals then you shouldn’t really suffer from gas, and especially not the really smelly stuff. Loud, largely scentless farts are hilarious and typically a sign that some bacteria in your digestive system are working away at breaking down some sugars or fibre. Really smelly, room clearing, rotten-egg-scented farts are a sign of protein putrefaction in your digestive tract. Not good. The proteins end up being broken down by pathogenic bacteria and cause the production of all kinds of nasty toxins. You don’t want that! You want your farts to smell like roses when they do come and one way to do that is to eat probiotic foods or drinks. Now you may understand why I’m so passionate about BMs and like to get people talking about theirs on the regular (har har). It’s one of the best indicators of overall health as good digestion breeds strong bodies and immune systems. Let’s take a quick look at some things you can do to ensure your BMs are regular and glorious! Dehydration causes a whole host of negative effects in the body, not the least of which include tiny rabbit pellet poops that are incredibly hard to pass. When your body senses that you’re running low on water it starts looking for it wherever it can and one place it finds it is in the colon where it reabsorbs the liquid needed to help you pass your poops. No one wants to reabsorb poop water and the toxins it contains, so drink up. One of the best things you can do for your regularity is ensure you get enough water every day. Try to aim for at least 6 glasses a day between meals. And no, coffee, sugary fruit juices, and pop DO NOT count. A good indicator of hydration is pee colour. If it’s light and straw colored you’re likely hydrated. If it’s too dark and smelly, up the water intake, yo! Our bodies are hosts to billions of bacteria and many of them live right in our digestive tract. There are strains of helpful bacteria, the most famous of which are lactobacillus and bifidobacteria. These guys colonize the small and large intestines respectively. They help break down food, produce various vitamins such as vitamin K and several B vitamins, and ensure that our digestion runs smoothly. The digestive system is incredibly sensitive to physical and emotional stress. Conditions such as IBS are commonly seen in individuals who have very stressful jobs and lives. What happens when we’re under stress is that energy and blood are diverted from our digestive system and sent to our muscles and extremities to help us run from a wild boar or pack of lionesses. Try yoga, stretching, or short walks daily. Do not bring your cell phone. Aromatherapy can be incredibly soothing for frazzled nervous systems. Scents such as lavender, rosemary, peppermint, or ylang ylang have been shown to help modulate stress and calm the nervous system. Daily meditation is incredibly beneficial for individuals trying to decrease their stress levels. There are tons of sites out there dedicated to the practice so google it up if you’re interested. So that’s my little crash course on pooping, digestion, and tips to help support regularity and amazing BMs. I’ve got a part two all lined up with a few more tips and herbal remedies for improving your mad digestive skills, so stay tuned! 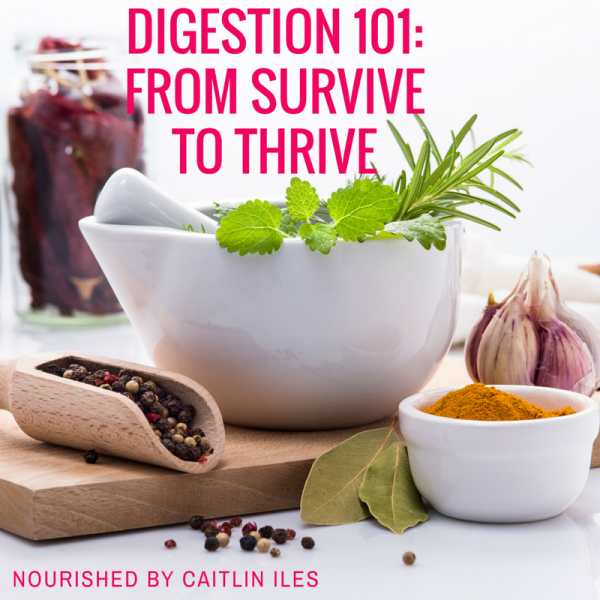 You can also check out this crash course on how to improve your digestive health by clicking here. Now I must away because I’m having a small, largely impromptu dinner party tonight and I’ve got cinnamon buns (gluten free of course!) to bake before the dinner cooking starts. Well that’s all for today fried. Have a whimsical weekend! And don’t forget to join my FREE Fully Nourished Community by clicking here. It’s where we share recipes, articles, support, and inspiration to help you live your healthiest life.